Melanie tells Paul she'd like to get some trophys for the darts tournament and he agrees. 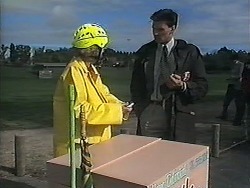 Melanie runs through some other prizes, and Paul reckons beauty treatments aren't appropriate as a prize. Melanie and Christina accuse him of sexist so he quickly backs down! Ryan is sulking that Gemma has gone to the concert with Matt. He really likes her, but she won't do anything with him! Clarrie takes an interest and asks if Ryan means "the car- wrecker across the road"(!) Ryan thinks Gemma saying she had a boyfriend in Brisbane was just an excuse to put him off! Harold, Eddie and Joe are chatting about the darts tournament. Madge comes in and says she needs Eddie at the Waterhole straightaway - someone else has called in sick. Harold is not impressed. 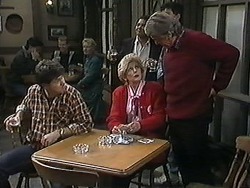 Joe suggests that Ryan could help out, but Harold doesn't want to upset Dorothy. Harold also wants someone to take the "Munch Box" out - he might do it himself. Madge says she could do it and Joe falls about laughing. So Madge decides to do it to spite them - she says it'll be good for community relations! Melanie has put up a sign announcing the Darts Tournament. She's got a lot of people signed up and goes through the list. She lets the words "Jim and Caroline" slip and Paul gets very angry. PAUL: Now, you listen to me. If I catch you spreading that story, you are going to be looking for another job, and don't think I don't mean it! Clarrie has advised Ryan to go out and fight for Gemma! 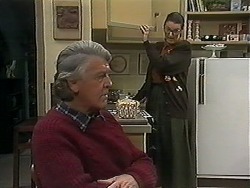 Dorothy tells Clarrie off. Clarrie says at least he listens to Ryan - Dorothy doesn't seem to. 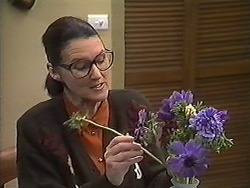 CLARRIE: I think it's about time you treated him more like a member of the family and less like one of your students! Madge is cycling the Munch Box along (a bike with a trailer). Some people flag her down and she serves them some sandwiches. Dorothy sees Madge and stops to buy Ryan a hot dog, dictating that it must be a wholemeal bun! 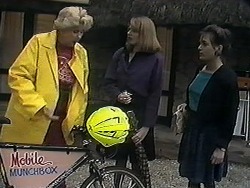 Madge informs Dorothy that she's combining the Munch Box with doing her own road survey for the Council! Paul asks Joe to keep Bouncer in - the dogs have been getting in the bins lately. 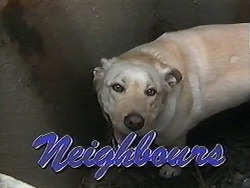 Joe says Clarrie's dog is a bad influence on Bouncer. 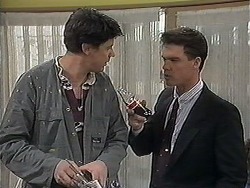 He starts joking about "young love" and Paul gets the wrong end of the stick, telling Joe that it's none of his damned business. Joe is confused. Christina is asking Melanie about her "mystery man" Roger but he's overseas at the moment. Madge cycles up on the Munchbox, moaning about the state of the local roads. Also she has bumped into just about everyone she knows! Joe and Clarrie are practising their darts technique. Eddie and Harold are looking on. Joe tells Eddie that Harold and Clarrie don't stand a chance in the competition! Eddie whispers to Joe that they could set up a small wager on the side. 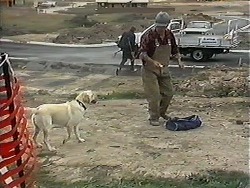 He takes Joe's darts for "safe- keeping"
Bouncer and Rosie are hanging around the site and a bloke feeds them with a sandwich. 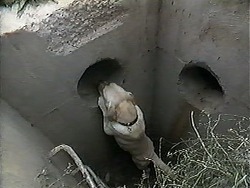 As they drive off, Bouncer falls into a deep hole. 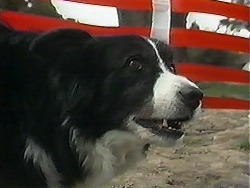 Rosie barks loudly, Lassie- style, but the workmen have driven away. Rosie is constantly barking outside, and Ryan lets her in. 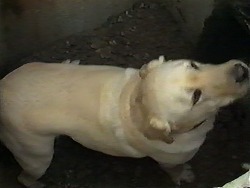 She continues to bark, Lassie- style but Dorothy says she's just over- excited. The darts tournament is in full swing. Madge is behind the bar tonight - she looks very stiff after her turn on the Munch Box today! At the bar, Paul and Christina are chatting about Jim and Caroline. Melanie announces that Clarrie and Harold are through to the next round of the tournament. Eddie whispers to Clarrie about a small wager and he tells him to put him down for $10. Bouncer is still down the hole. 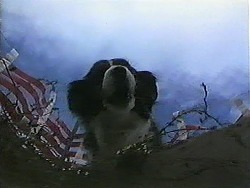 Rosie has returned and is barking down at him. Joe tells Dorothy that Bouncer is missing and she tells him that Rosie is also missing - neither of them came back last night. Joe goes off to look for them. Bouncer is still down the hole. Rosie is still barking down at him.